Appeared: Resident Evil 2, Resident Evil Gun Survivor (mention in the game), Resident Evil 4, Resident Evil The Darkside Chronicles. "I'm going to scrub this virus from the face of the earth!" In 1998, It was a regular day for rookie cop Leon Kennedy. Entering Raccoon City, a body was lying on the ground in front of Leon's jeep. He got out of the jeep and inspected the body. Leon wonder who could of done such a horrible thing. He began to hear moans behind him. He quickly took out his handgun and pointed at the zombies. He yelled at them telling them to stop and don't move. Suddenly, the body on the floor began to move and grab Leon's angle. He shot the civilian, slowly walk backwards and began to shoot the zombies in front of him. While shooting, he met a young girl name Claire Redfield. He told her to follow him to the police station. They both ran and found a police car. Soon they were on there way to the police station. Claire told Leon that she was looking for her brother in the city but quickly interrupted her. On the way there, A zombie was in the back seat and tried to get a hold of leon. They crash the car but soon enough, a truck sped up to them. They quickly got out of the car and the truck crash to the car, causing an explosion. The two were seperate. Leon yelled to Claire to meet him at the police station. The streets were cover with zombies. Leon manage to evade the zombies and find the police station. Later, he met up with Claire and told her that her brother is not here and they need to escape the city. He gave her a radio and they both left. Hours later, he met a mysterious women name Ada Wong, who was looking for her boyfriend John. He manage to team up with Ada and help her. During the process of escaping, a monster code name "MR.X" followed Leon around the police station. After finding out who was behind infecting Raccoon city and trying to find claire, He found Ada who has gone missing for awhile was shooting at MR.X. Leon yelled at Ada and began to help her fight the monster. MR.X ram Ada into a electric generator and instantly sent her to the ground. Leon got a hold of the virus that Ada was holding and threw it across the ledge. MR.X followed the virus and ran over the ledge into a boiling containter. Leon ran to Ada and help her. It was too late for Ada and she died in his arms. Depressed, he moved on and left the area. Claire radio Leon and told him that he need to pick up Sherry at the security room. He agree and pick her up. He picked her up and brought her into a train. He quickly ran around the station to find the power generator to power on the train and the gates. During the process, MR.X jumped out of the boiling containter and attacked Leon. Leon manage to kill MR.X by a rocket launcher that a mysterious women threw down. He ran back to the train, open the gates and power on the train. When the train was leaving, Claire appeared and jumped on the train while it was moving. She quickly gave Sherry the antidote. Sherry quickly woke up but the reunion was cut short. The train stopped and Leon ran to the back of the train to investigate. A giant monster attacked Leon and he was force to fall back and kill the monster by his back to the doors. He killed the monster and ran back to Claire. The doors were jammed shut and he was force to climb on top of the moving train. He manage to open a hatch that led to the control room and found Sherry in there. He told her to hit the emergency button and she did. The train stopped. Leon and Sherry got off the train and met up with Claire. They ran to the end of the tunnel because the train was about the explode. The train exploded and the chaos was over. After the whole ordeal, Claire told the two that she will be back for them and ran into the Raccoon City woods. Hours later, the army pciked up Sherry and Leon. Later Leon met a government agent. The man told Leon that Sherry will be in protect custody and offer Leon to help bring down Umbrella. Leon accepted. Since darkside chronicles hasn't come out yet, we don't don't what happen. We will finish this section when we know more. Leon now part of the government agency, he is sent to spain to rescue the president daughter. While trying to find the president daughter, he discover that the infection has evolve and is now known as the "Las Plagas". He also learns that the cult who capture Ashely Graham (the president daughter) is called the "Los Illuminados". While investigating, he was injected by the Las Plagas virus by Saddler's henchmen. Saddler is a man who is the god like ruler of the Los Illuminados. While there, he met Ada Wong, who nows works for Wesker. Krauser (his old partner that fake his death), Luis Sera (who died trying to give Leon the vaccine for the Las Plagas). He manage to save Ashely many times despite her being capture numerous times. Leon also manage to kill Krauser, Salazar ( who is the castle owner) and a village cheif that tried to kill Leon. After escaping the incident by riding a jet ski, Leon now knows what he's up against. He writes his finding in a report where Chris Redfield mentions in Resident Evil 5. After the incident, Leon regroups and is sent to a airport in Harvardville where a biohazard is announced. Once there, he meets S.R.T. (Special Response Team) members Angela Miller and Greg Glenn. They tell him that there are survivors in the airport and one of the survivors is the senator. In the airport, they rescue the senator and the survivors. With the survivors is Claire Redfield. They help the survivors escape the airport and they regroup outside. Once there, all the survivors are force to take vaccine that were provide by WilPharma. When taking the vaccine out of the trucks, the trucks manage to explode. After finding out who might of done this, they thought of a man name Curtis Miller, who was on the news trying to get the "truth out". Not knowing that it was Angela brother, Leon and Angela rush to his house. When they arrive, they found that Curtis Miller's house was enguled in flames. Later, Leon gets a call from Claire saying to get to WilPharma that they are holding the G-Virus. Soon enough, the phones were disconnect and they rush to WilPharma. Arriving and regrouping with Claire, he told her to get out but she refuse. They went to there seperate ways. Leon regrouped with Angela and found Curtis Miller transform into a monster (like William Birkin in RE2). He manage to take an assault rifle and shoot the staris from upstaris to break and fall down on Curtis. Later after killing Curtis, Leon and Angela regroup with Claire and the senator outside explaining that the senator was behind it. Leon quickly tols Claire that the senator was not part of it. After hearing the bell when it hit midnight, Claire immediately thought of who was behind the mess. They meet up with a man thats is head of WilPharma (Fredrick) and arrest him with the vaccine of the T-virus. After arresting Fredrick, Angela, Leon and Claire said there goodbyes and part ways. While leaving, Leon said goodbye to Claire and told her that they should meet in a better environment. She smile and Leon jumped on the helicopter leaving the incident behind him. Appeared: Resident Evil 2, Resident Evil: Code Veronica, Resident Evil Degenration, Resident Evil The Darkside Chronicles. "I have to find my brother..."
In 1998, Claire rode to Raccoon City to visit her brother Chris Redfield. At the time, the city was infested with the virus and everyone was either dead or left the city. She park her bike and went into a diner to ask where the police department was. During her scearch, she found a zombie eating a human corpse. Disgusted, she slowly retreated back to the entrance, but zombies block the door. She ran to the back door of the diner and found a man pointing the gun to her. He yelled to get down, Claire got down and the man shot the zombie. She quickly looked at the man. "It's not safe here, head to the police station. You'll be alot safer." He said. The two ran around the alley and spotted a police car. They got in the car and drove to the police station. The man who save Claire was Leon S. Kennedy, a new police officer who got transfer. On the way there, Claire open the glove conpartment and took the handgun that was inside. Immediately after, a zombie jump to Leon and force the car to crash into a guard rail. Still in shock, They look behind them and saw a truck was coming full speed to them. They got out of the car and quickly ran for cover. After the explosion, Leon yelled to Claire that he will meet up with her at the station. After the crash, she ran to the police department avoiding zombies. She got inside and walk around the station to find where her brother was. After searching, she walk inside the S.T.A.R.S. room and found Leon near a desk. Leon greeted her and said that her brother is not here and gave his diary to her. He then said that they need to escape the city and find any survivors. He then gave her a walkie talkie and left the room. Hours later, Claire met Sherry Birkin (the daughter of Annette Birkin and William Birkin), Annette Birkin (a scientist that works in the inderground lab. Claire found out that a man name Cheif Irons locked down the police station and personally killed every officer including the mayor's daughter. After finding out, Claire was forced to kill a creature that was injected by the virus. Claire and Sherry got split up and Sherry was injected with the virus. She than learn that Umbrella was behind of infecting Raccoon City. Claire than found a train and got on it. She was force to kill a mutated William Birkin but William manage to escape. Later, She radio Leon and told him to get Sherry and take her to the train while she gets the vaccine. Claire rushs to make the vaccine. After making the vaccine, she ran to the elevator where the train was but was interrupted by William Birkin. She was force to kill William Birkin. She went in the elevator and got on the train while it was taking off. She injected the vaccine in Sherry and waited for her to wake up. Within seconds, she woke up but was interrupted by a loud crashing sound and alarms going off. Later, a mutated William Birkin attacked the train. They got off the train and ran to the end of the tunnel. The train exploded and the incident was finally over. After that, Claire ran in the woods saying "I have to find my brother. I'll come back for you guys." She never went back for them. Claire was capture and put in prison in Rockfort Island. During the whole ordeal, She found out that a new virus was created named T-Veronica, she met a young man name Steve Burnside. After the whole ordeal, she was rescue by her brother, Chris Redfield and they escape the island together. Claire joined a company name Terra Save. She was suppose to meet a friend in Harvardville Airport but in a blink of an eye, was slowly turning into a infected airport. Claire gather as many survivors as she can and ran into a room where she waited for help. Claire than heared a scream and went to investigate. On the way there, a man yelled "Get down". Yet again, she got down and saw that Leon rescue her once again and he was the rescue team. Leon got Claire out of the infested airport and met Fredrick who works with Wil Pharma. She than follow the man into the HQ of Wil Pharma and went inside. After mintues in there, the place was exploded. After the incident, Claire woke up and witness that the place didn't collaspe and that Wil Pharm was holding the G-virus. She slowly got up and pick up a staff to ease the pain and help to make her walk. Minutes later.. She met up with Leon and took an elevator. After the short meeting, she ran to the control room and helped Leon killed a mutated monster. After helping Leon, they arrested Fredrick for releasing the virus. Later Leon and Claire said there goodbyes and went there seperate ways. Appeared: Resident Evil Zero and Resident Evil Umbrella Chronicles. Billy Coen is an ex-marine who was convincted of murdering 23 people while serving in the war. After the war, he was convinced guilty and sentenace to death. While police officers were transporting Billy, The military police truck got attack and killed the officers inside the truck. Billy escape and took shelter in a train that stop in the middle of the forest. While in the train, he met S.T.A.R.S. member Rebecca Chambers. He teams up with Rebecca and finds out that the train is infested with leeches. Soon after the train begins to speed off the cliff, Rebecca and Billy raced to the control room and hit the brakes to the train. After the train crash into an underground train station, they soon discover that a man name James Marcus is the former operative of the Umbrella facility. After getting spilt up and fighting bio-weapons, They meet William Birkin. William activates the self-destruct system and a Queen Leech appears in front of Rebecca and Billy. During the battle, Rebecca throws a Revolver to Coen. Coen aims at the leech queen and kills the queen. They escape the facility and run into the forest, watching the mansion explode. They turn there attention to an another mansion. Rebecca then goes her seperate way and so does Billy. Appeared in: Resident Evil, Resident Evil Remake, Resident Evil 3, Resident Evil Darkside Chronicles, Resident Evil 5. "You need to stop him! Chris, you're the only one who can! Before it's too late... Don't you trust your partner?" Jill Valentine is one of the main characters in Resident Evil. In 1998, she joined the S.T.A.R.S. unit in Raccoon City and was the youngest in the group. A number of murders were taken place outside of the city and bravo team were sent to investigate the murders. On the drop off along with Chris Redfield, they were attack by crazed dogs and were force to take shelter in a mansion. This is known as the mansion incident. What they undercover was that there head leader Albert Wesker betrayed them and worked for Umbrella. After the incident, She stood in Raccoon City and tried to spread word along with Chris that Umbrella was part of the creation of the zombies. While Chris headed for Europe, Jill stood behind to take care of business. Soon enough, Raccoon City was infested with the virus. Left stranded in the streets, she wander aimlessly around the city looking for a way out. During the process, she saw a former S.T.A.R.S. member Brad Vickers and followed him. She finally caught up with him and he told her that some big monster is killing all former S.T.A.R.S member. He left and Jill headed for the Raccoon City Police Department. When she reached the department, Brad came up behind her severly hurt and telling her to go in the police department. As soon as he finish a monster appear and in front of Jill's eyes, the monster killed Brad. After killing Brad, the monster looked at her and walk to her saying "stars....". After evading the monster, she met up with umbrella's mercenaries Carlos Oliveria, Mikiai and Nickolai. She was told to gather parts for a train so they can get to the clock tower and escape the city. After a while, she gather the parts, put it in the train and started it up. On the way there, the monster known as Nemesis jumped on and attack them. The wounded solider Mikiai order them to go in front of the train. Once there, he grab a grenade and detonate it. After the train crash, Nemesis survived and followed her. Jill called in a helicopter but when the helicopter was about to land, Nemesis shot it down with a rocket launcher. Jill had no choice but to fight. During the fight, Nemesis infected her with the virus causing her to fight a little harder but causing pain as she fought. Nemesis fell to the floor and Jill fell to the ground. Carlos comes and picks her up and drops her off in a room to get an antidote. Hours later, Carlos arrives with the antidote and cures her. He informs her that Nickolai betrayed him and he is working for Umbrella. Jill gets up and heads to a Facility. There she contacts a another helicopter and once again she fights nemesis for the last time. After beating nemesis, she is pick up by a former member of S.T.A.R.S. Barry burton. Jill and Carlos escape Raccoon City and saw the city explode by a missile. Years later, She joins the BSSA, reunites with Chris Redfield and heads to Russia. While investigating the facility, she is told that a new virus is created by the name TALOS. She fights the monster that the creator of TALOS let loose (Sergei Vlamidir). Once the monster is down, they escape the city and brought down Umbrella. Later Jill and Chris get a reliable tip on where the founder of Umbrella Ozwell E. Spencer is located. They travel to the mansion and encounter Wesker at the end. Wesker killed Spencer and Wesker then fights Jill and Chris. In the process, Wesker gets Chris in a choke hold unable to get out. Jill then run to Wesker, spears him and go through a window taking the Wesker with her. After the accident, Wesker takes her and use her as an experitment. He injects her with the new virus and finds that she has the weak state of the virus in her body. Wesker then puts a device on her chest to pump the virus in her body. She is found in Kijuju where Chris finally finds her and takes the device off her. She tells Chris that Wesker is going to release the virus and Chris needs to stop him. She is then later found on a chopper rescuing Chris and Sheva (Chris partner) and kills Wesker. Appeared: Resident Evil, Resident Evil 2 (Extreme Mode) Resident Evil Umbrella Chronicles, Resident Evil Code Veronica, Resident Evil 5. "More and more I find myself wondering if it's all worth fighting for. For a future without fear...yeah, it's worth it." 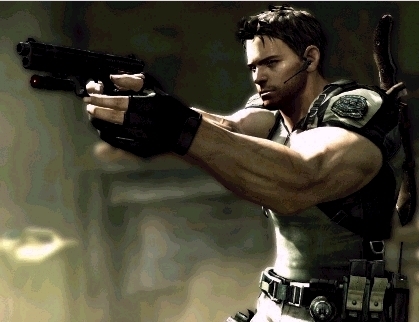 Chris Redfield is one of the main characters in the series. When he was a young boy, his family was in a fatal car accident and he was left to take care of his sister Claire Redfield. Later on, he joined the military and learned how to piolet a fighter jet. After two years in the military, he left the military with high hopes. He then joined the S.T.A.R.S unit in Raccoon City and became famous by his skills in hand to hand combat and large use of weapons. In July 24th 1998, he was order to look for a unit that gone missing (They were order to investigate a number of civilians being murder outside the city). The team that went to look for the missing team were Chris Redfield, Jill Valentine, Albert Wesker and Barry Burton. They were force to take shelter in a mansion due to craze dogs chasing them. While investigating the mansion, Chris found out that Umbrella were the ones behind the virus outbreak and Wesker is with Umbrella. After the incident, the S.T.A.R.S unit and Raccoon City fell to the ground. He went to Europe to look for the Umbrella HQ. During that time, Chris was inform by Leon S. Kennedy that Claire was in trouble in Rockfort island. Chris then raced to the island to rescue his sister. 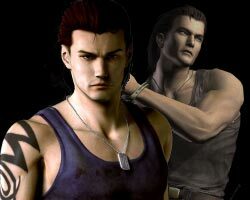 When he got there, he learned that a new virus was made (T-Veronica) and that Wesker was still alive. After rescuing his sister, he promise that he will take down Umbrella no matter what it takes. Years later with his partner Jill Valentine, they attacked the Umbrella facility in Russia. They later found out that a new virus was made code TALOS and a man name Sergei Vlamidir was the creator. After killing the monster that Sergei release, they escape the facility and brought down Umbrella. From that day, They forcus on bringing down Wesker. Chris Redfield along with Jill, joined the BSSA. After taking missions that involve bio smuggling and reduce the infection, they got a reliable tip on where the founder of Umbrella (Ozwell E. Spencer) was located. They rushed to the location to talk to the founder but once they reached his the Ozwell studies, Wesker was there and killed Spencer. Wesker, Chris and Jill fought until Wesker grab a hold of Chris and started to choke him. While Jill was recovering from a brutal attack, she quickly ran to Chris and spear Wesker into a window bringing Wesker and herself falling. After that, Chris quickly order a search for Jill but after months, Jill was presume dead. Chris knew something that no one knew. Chris knew that Jill was still alive and took every mission involving the virus to find Jill. After numerous of missions, he got a tip that a new virus was being created and a man name Irving was behind it. He then went to Kijuju to apprehend Irving. Arriving at Kijuju, he was greeted by his new partner Sheva Almor. During the events in Kijuju, A new virus is created and is knowned as Uroboros, Irving is killed by Chris and Sheva, A woman name Excella Gionne joined Wesker and plan to let the Uroboros into the world. While fighting Wesker, a masked lady was there guarding Excella. Unmasked was Jill Valentine. Chris eyes open wide and despite it all, he was force to fight Wesker and Jill. After the fight, Jill had a device on her chest that was to pump the virus in her body. Chris then along with Sheva, rip the device off her and finally found Chris old partner. The meeting was short due to Wesker casually running away. Later Chris finds out that Wesker is using serum to keep the virus in his body and using too much will kill him. They found the serum, killed Excella and tried to catch up to Wesker. Finally they reached Wesker. He boarded a aircraft fill with the virus and Chris and Sheva boared the aircraft. After catching up with Wesker and fighting him in a hangar, they injected the serum into Wesker and caused him to recoil due excessive doses. After fighting wesker more, the aircraft crash into a volcano and yet again they were force to fight the mutated Wesker. This time, Wesker will finally die. Jill got an airplane with a fellow BSSA member Josh. The two climb up the ladder to board the plane and fire Rocket Launchers to kill Wesker.